At the beginning of 2011, after being publically exposed for its grave violations of Venezuelan law and sovereignty, the OTI closed its doors inVenezuela and USAID operations were transferred to its offices in the US. The flow of money to anti-government groups didn’t stop, despite the enactment by Venezuela’s National Assembly of the Law of Political Sovereignty and NationalSelf-Determination at the end of 2010, which outright prohibits foreign funding of political groups in the country. US agencies and the Venezuelan groups that receive their money continue to violate the law with impunity. In the Obama Administration’s Foreign Operations Budgets, between $5-6 million have been included to fund opposition groups in Venezuela through USAID since 2012. 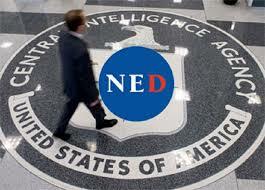 The NED, a “foundation” created by Congress in 1983 to essentially do the CIA’s work overtly, has been one of the principal financiers of destabilization in Venezuela throughout the Chavez administration and now against President Maduro. According to NED’s 2013 annual report, the agency channeled more than $2.3 million to Venezuelan opposition groups and projects. Within that figure, $1,787,300 went directly to anti-government groups within Venezuela, while another $590,000 was distributed to regional organizations that work with and fund the Venezuelan opposition. More than $300,000 was directed towards efforts to develop a new generation of youth leaders to oppose Maduro’s government politically. One of the groups funded by NED to specifically work with youth is FORMA (http://www.forma.org.ve), an organization led by Cesar Briceño and tied to Venezuelan banker Oscar Garcia Mendoza. Garcia Mendoza runs the Banco Venezolano de Credito, a Venezuelan bank that has served as the filter for the flow of dollars from NED and USAID to opposition groups in Venezuela, including Sumate, CEDICE, Sin Mordaza, Observatorio Venezolano de Prisiones and FORMA, amongst others. Detailed in a report published by the Spanish institute FRIDE in 2010, international agencies that fund the Venezuelan opposition violate currency control laws in order to get their dollars to the recipients. Also confirmed in the FRIDE report was the fact that the majority of international agencies, with the exception of the European Commission, are bringing in foreign money and changing it on the black market, in clear violation of Venezuelan law. In some cases, as the FRIDE analysis reports, the agencies open bank accounts abroad for the Venezuelan groups or they bring them the money in hard cash. The US Embassy in Caracas could also use the diplomatic pouch to bring large quantities of unaccounted dollars and euros into the country that are later handed over illegally to anti-government groups in Venezuela. What is clear is that the US government continues to feed efforts to destabilize Venezuela in clear violation of law. Stronger legal measures and enforcement may be necessary to ensure the sovereignty and defense of Venezuela’s democracy.